Air hockey is one of those games that everyone sort of knows how to play; even as a kid you get the basic gist of it, crashing the paddles across the table to throw the puck into the opponent’s goal. 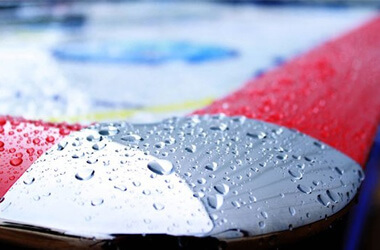 But there are real rules, and even air hockey associations and federations with strict guidelines – so we’ve put together a reference for those looking to bring their air hockey game up to pro-level. First, you flip a coin. Winner of the coin flip gets to decide which side of the table they start on. After each game, you and your opponent swap over. Next, you have a “face-off” round, which counts as the first round of the match. 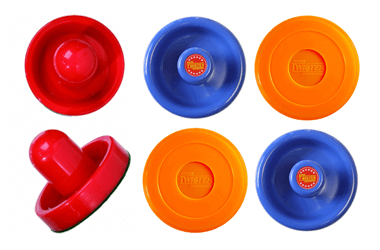 The puck starts in the centre of the table, and players can start with their mallets anywhere except within one inch of the puck. On the count of three, the players can go for it, and battle to hit the puck into the opposing goal. All further games kick-off with one person in possession of the puck; the winner of the face-off begins games 3, 5 and 7 with the puck, and the loser begins games 2, 4 and 6 with it. Phew. Alternatively, if you’re just playing one or two games, you can just start it in the centre and give it a good smack! During play, players can stand anywhere around the table as long as they don’t pass the centre line. The player can only hit the puck if it’s on their side of the centre line, and when the puck passes over the centre line, the player has seven seconds to return it – a sneaky rule to prevent faffing about and lining up trick shots. If the puck is touching the centre line, any player can hit it. Interaction with the puck is the main mechanic, and therefore there are some very specific rules about how you can and can’t hit it: most notably, you can’t bring your mallet down on the puck to stop it or drag it. This is called “topping”, and constitutes an immediate foul. The only exception is if the puck goes flying off the playing field – you can use the mallet to bat it back towards the table! For a player to score a point, the puck must land in the opposing player’s goal, and stay there – if it bounces in and out, it doesn’t count! It doesn’t matter whose mallet the puck touched last, so own goals are entirely possible. Within each game, possession of the puck for the next serve passes to the player who was scored upon. The winner of each game is the first player to accumulate seven points. If you’re playing tournament-style, you’ll also be playing to best-of-seven – so the first person to win 4 games. 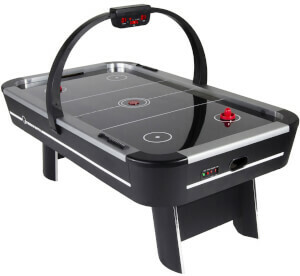 We took a look at the US Air Hockey Association rules to find some extra challenges and trivia – whether you want to recreate the tournament at home, or just show off your air jockey knowledge, these should come in handy! Penalties and fouls: A standard foul penalty is forfeiture of the puck. You should also be aware of distraction penalties, given if you’re found talking, creating loud noises, or “excessively screaming”. Yep, really. Referees: Players can choose to play without a referee on the understanding that there may come about “irreconcilable controversies”. Best to have a print-out of the rules nearby for such an event. Tournament timing: Players may take a maximum two-minute break between each game, and maximum 15 minutes between sets. 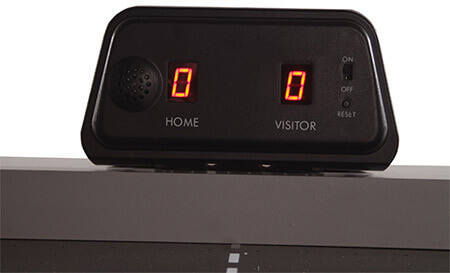 If a player has been informed that their match is starting, but does not report to the table within five minutes, they lose one point for each minute over that they are not present. This could be an interesting one to try out at home!